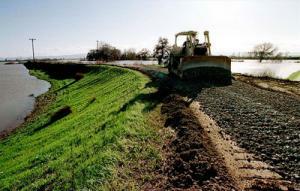 Earthen levees protect dry land from floods and function as water storage and management systems. Over 21,000 kilometers of earthen levees deliver approximately two-thirds of potable water to more than twenty-three million Californians and protect more than $47 billion worth of homes and businesses from flooding. Scientists say that the ongoing extreme drought in the state poses a risk of catastrophic failure to California’s levee systems and highlights an urgent need to invest in research regarding the vulnerabilities of these systems under extreme climatic events. Farshid Vahedifard, a Mississippi State University assistant professor of civil and environmental engineering, A is the lead author on a letter, titled “Drought threatens California’s levees,” published last week in Science magazine. The letter discusses the threats that ongoing extreme drought poses on California’s levee systems and highlights an urgent need to invest in research regarding the vulnerabilities of these systems under extreme climatic events. Earthen levees protect dry land from floods and function as water storage and management systems, the letter states. Vahedifard points to a 2011 report by the California Department of Water Resources which says that over 21,000 kilometers of earthen levees deliver approximately two-thirds of potable water to more than twenty-three million Californians and protect more than $47 billion worth of homes and businesses from flooding. However, current drought conditions pose “a great risk to an already endangered levee system,” the authors warn. Drought conditions — and particularly drought ensued by heavy rainfall and flooding — may cause similar catastrophic failures in California’s levee systems as seen in 2008 along river banks of the Murray River at the peak of Australia’s Millennium Drought and in 2003 in the Netherlands’ Wilnis Levee. An MSU release quotes Vahedifard to say that the commentary is important because there is very little information published about the effect of drought on the performance of critical infrastructures. The civil engineer who specializes in geotechnical engineering added that the National Levee Database shows that only around 10 percent of U.S. levees are rated as “acceptable,” with the rest being rated as “minimally acceptable” or “unacceptable,” indicating that the levee has a minor deficiency or the levee cannot serve as a reliable flood protection structure, respectively. In California, a vast number of levee systems are currently rated as “high hazard,” meaning they are in serious danger of failing during an earthquake or flood event. This indicates that the resilience of these levee systems is a major concern without even considering the effects of the ongoing extreme drought, Vahedifard said. Prolonged droughts threaten the stability of levee systems by inducing soil cracking, increased water seepage through soil, soil strength reduction, soil organic carbon decomposition, land subsidence and erosion, he explained. “When you have a marginal system, then you just need the last straw to create a failure,” Vahedifard said. MSU notes that he began research related to climate change and its impact on critical infrastructure with his colleague AghaKouchak, a hydrologist, since 2013. They hypothesized that California’s current extreme drought will accelerate the ongoing land subsidence — or sinking. Recently, NASA’s Jet Propulsion Laboratory at the California Institute of Technology published a report that shows the Central Valley is undergoing an unprecedented subsidence period of as much as two inches per month in some locations [see “Drought causing California’s San Joaquin Valley land to sink, damaging infrastructure,” HSNW, 24 August 2015]. “This is exactly what we predicted, that this drought would lead to increased land subsidence,” Vahedifard said. The danger, he explained, is that it increases the risk of water rising over the top of the levees. “At MSU, I have been working on quantitatively assessing the resilience and vulnerability of critical infrastructure to extreme events under a changing climate. While several large-scale studies have been conducted to evaluate various aspects and implications of climate change, there is a clear gap in the state of our knowledge in terms of characterizing uncertainty in climate trends and incorporating such findings into engineering practice for planning and designing critical infrastructure,” Vahedifard said. “An improved understanding of the resilience of critical infrastructure under a changing climate indisputably involves many authoritative and complex technical aspects. It also requires close collaboration between decision makers, engineers, and scientists from various fields including climate science, social science, economics and disaster science. Community engagement and public risk education also are key to enhancing the resilience of infrastructure to climate change,” he added. “The impacts of climate change on infrastructure pose a multi-physics problem involving thermo-hydro-mechanical processes in different scales. Further research can help communities and decision makers toward developing appropriate climate change adaptation and risk management approaches,” he said. He emphasized that design and monitoring guidelines may need to be modified to ensure resilient infrastructure against extreme events under a changing climate.